Li2CO3-doped (K0.48Na0.48Li0.04)(Nb0.90Sb0.06Ta0.04)O3 lead-free piezoelectric ceramics have been fabricated by an ordinary solid-state reaction method and the effects of Li2CO3 on structure, phase transition and piezoelectric properties of the ceramics have been studied. 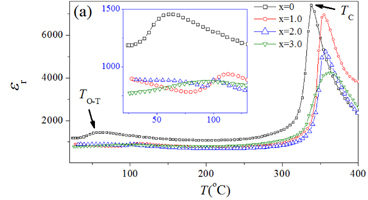 After the addition of Li2CO3, the ferroelectric orthorhombic / ferroelectric tetragonal (TO-T) and ferroelectric tetragonal/paraelectric cubic (TC) phase transitions shift to high temperature and the TO-T and TC increase from 338°C/60°C to 362°C/111°C. All the ceramics possess a pure perovskite structure and the addition of Li2CO3 increases the orthorhombicity of the ceramics. A small amount of Li2CO3 (=1 mol %) suppresses the grain growth of the ceramics, while as Li2CO3 increases to 2-3 mol%, the grain becomes significantly large. Our results show that because of the effective compensation of the volatilization loss of alkaline elements, the piezoelectric properties of the ceramics are enhanced significantly after the addition of 0.5 mol% Li2CO3 doping, giving piezoelectric coefficient d33 = 298 pC/N and electromechanical coupling factors kp = 53.8%.